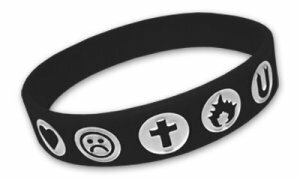 These silicone wristbands bear the eye catching 5 symbols that will attract attention and get you into conversations about what they mean. There are two sizes – regular (202mm long x 12mm wide x 2mm thick) and small (180mm long x 12mm wide x 2mm thick). So, the small bands are about 2cm smaller in diameter than the regular bands and are generally preferred by children and women with smaller wrists. 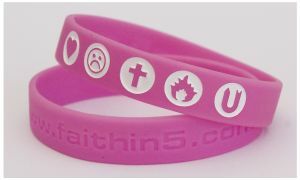 Both sizes come in 7 colours – purple, black, navy, bright pink, turquoise, apple green and bright red. A small message card with a one sentence explanation of each of the symbols. A large message card with a one paragraph explanation of each of the symbols. You can buy a wristband on its own, but it’s better to buy the pack so that you have the cards with the explanations of the symbols. Of course if, having bought a pack with the explanatory cards, you want to buy more bands, you can simply buy the bands on their own. You can buy additional message cards to give away – see under “Message Cards”. Why not buy a few wristbands, one for you and others to give away? 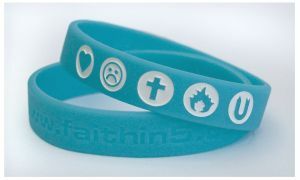 MINIMUM order of 3 wristbands. 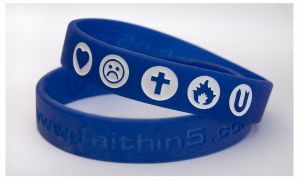 Buy 10 wristbands or wristband packs and get an 11th one FREE! You can order below if you want random colours and sizes. If you want specific colours and sizes, please use the ‘Contact Us’ tab and either ring us or e mail through your requirements. Thanks! If you buy 20 or more and we’ll give you a special deal. See under “Bulk Orders”.